Articulate Engage lets you add interactive SWF files, also known as Flash files, to your interactions. This is great news if you've developed Flash objects to extend the functionality of your e-learning content. 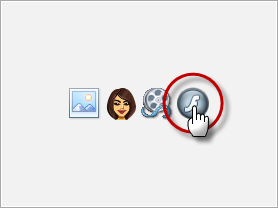 If your SWF file is a movie that requires no interaction from learners, insert it as a video. This synchronizes the video with the interaction. Click here to learn more about this method. If your SWF file contains interactive elements, insert it as a Flash file as described below. This plays the SWF file independently of the interaction. Select the step where you want to add a Flash file. Browse to the SWF file you want to use, and click Open. After inserting a Flash file, you can preview it using the Play/Pause and Stop buttons below the Flash thumbnail in the Media panel. Position: Choose where you want the Flash file to display in your published interaction. Include Playbar: Mark this box to add player controls to the Flash object, letting learners pause, play, and scrub back and forth. If you include a playbar, you'll also have the option of automatically starting the Flash object or waiting for learners to start it when they're ready. Alternate Text: Do your learners use screen readers? The Alternate Text field can help with that. Just enter text that describes the Flash file, and screen readers will read it to your learners. 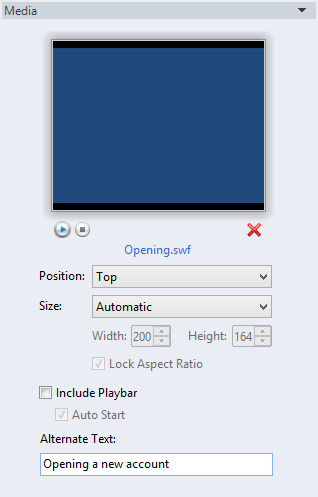 If you change your mind about a Flash file you inserted and you want to use a different one instead, click the blue text in the Media panel below the Flash thumbnail (i.e., the name of the SWF file). Then select a different SWF file, and click Insert. If you want to replace a Flash file with a different media type altogether (picture, character, or video), click the red X in the Media panel to remove the Flash object. Then choose a different media type.